A bookmark is a way to define areas of your workspace for easy access. The bookmark shades an area, usually one that is carrying out a specific task, so you can easily move to it in the workspace. You can control some aspects of the appearance and behavior of bookmarks in Tools > FME Options > Workbench, under Bookmark Options. Places a marker for quick access to a certain area. Divides a workspace into different, clearly marked sections. Organizes a workspace so you can move sections of transformers at one time. Makes large workspaces easier to manage by collapsing sections that are bookmarked. Remembering why you created a workspace: Bookmarks can help remind you why you created a workspace, and how it works. Deciphering someone else's workspace: Bookmarks can clarify the purpose of a workspace, and provide the necessary context for determining how it works. Select an area of the workspace (for example, a group of transformers) that you want the bookmark to encompass. Click the bookmark tool or right-click and select Create Bookmark. A bookmark appears around the selected area. Alternatively, click the book mark tool, or right-click on the canvas and select Insert Bookmark. Then drag the bookmark over the area you want the bookmark to encompass. To give the bookmark a new name, double-click on the name, right-click and select Rename. If the characters in your name exceed the width of the bookmark, the name is truncated. Mouse-over to display the full name. Note: You can create bookmarks that are nested inside other bookmarks. 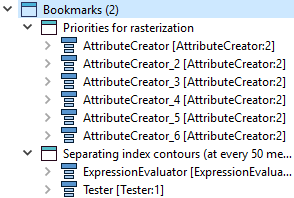 You can collapse bookmarks to condense their contents and make large workspaces easier to manage. Collapsed bookmarks can be a useful alternative to custom transformers. Click the arrow beside the bookmark name to collapse or expand it. When you collapse a bookmark, the only contents that display are the bookmark name and the names of any objects inside the bookmark that are configured for input or output. Mouse-over for a summary of the bookmark contents. Click on the bookmark, hold down the mouse button, and drag the bookmark's handles. Click on the bookmark's title bar and drag to move the bookmark to another location on the workspace. By default, the bookmark's contents are attached to the bookmark. When you move it around, the contents follow. This makes it a useful tool for organizing workspaces: you can move entire sections around the canvas until they are in a good layout. To change this behavior, right-click and toggle Move Contents With Bookmark, so it is no longer checked. A transparent magnet icon displays beside the name to indicate the contents are not attached. To display the Edit dialog, click the bookmark's gear icon , or right-click and select Properties). The Edit dialog allows you to change the bookmark name and its color properties. To rename a bookmark, double-click a bookmark name in the workspace. To add a bookmark description, use annotations. Double-click the bookmark name in the Navigator. Click (once) on the bookmark name in the Navigator. You can navigate through the bookmarks in a workspace. As you navigate, Workbench focuses and zooms on each bookmark. Use the left and right arrows to zoom and focus on each bookmark, sequentially, in the workspace. Alternatively, select a bookmark from the drop-down list. To zoom out to the entire workspace, select Show Workspace. Tip: When the bookmark navigator is available, you can also navigate bookmarks using the space bar (forward) and Ctrl + space bar (back). Note: By default, the navigator widget excludes bookmarks that are nested inside other bookmarks. To include a nested bookmark in the navigator widget, open the nested bookmark's properties, and set Bookmark Navigator to Include. Note that this setting is only available if the navigator widget is added to the toolbar, and is visible. That is, if the FME Workbench window is too small to display the widget, the Bookmark Navigator setting does not appear). Right-click and select Create Custom Transformer to open the Custom Transformer Properties dialog. Note: See Creating Custom Transformers for information on the parameters in this dialog. The objects that were inside the bookmark appear in a custom transformer window, under a new tab. The bookmark that was in the original workspace is replaced by a link to the custom transformer.